Mental_floss blog editor Jason English told me his daughter wanted a cuckoo clock, but she wanted one with a dog instead of a cuckoo. I began to wonder why clocks use cuckoo birds to identify the hour. As it turns out, there are quite a variety of ways clocks will announce the hour. Image by Flickr user Matt Sephton. Ctesibius of Alexandria was a Greek mathematician and engineer of the third century BCE. His work with pneumatic and hydraulic pumps led to quite a few inventions: the water organ, the water clock, a pump for firefighting, and even a compressed air cannon. Ctesibius was said to have built a clock that featured a moving owl and a whistle, but most of his writings were lost in the Library of Alexandria fire in 48 BCE. The form of the traditional cuckoo clock as we know it came about in the 1600s, with the date of the first Black Forest cuckoo clock thought to be around 1629. This 1650 drawing details an early German cuckoo clock, which featured a bird that moved its beak, wings, and tail, and a cuckoo sound produced by two whistling pipes within the clock. It was only later that the bird sound was synchronized to announce the hour. Image from Deutsches-uhrenmuseum. 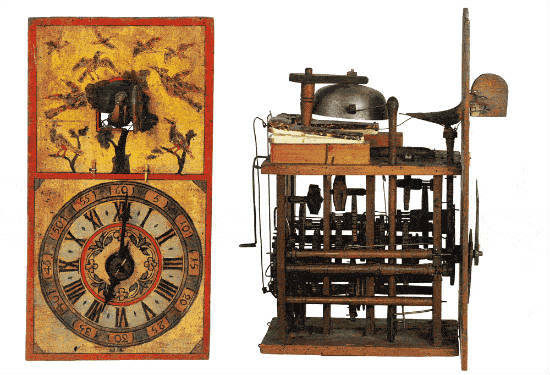 The first clockmaker in the Black Forest region must have done well, since his neighbors and then entire villages began to manufacture mechanical clocks to sell, some with birds or roosters to make sounds. The first real “cuckoo” sound is said to have been invented by Franz Ketterer in 1730 or 1738. As this sound was easier to manufacture than whistles or rooster crows, the idea spread quickly through the clockmaking industry. However, other sources say the origin story is a legend, as Ketterer was not born until 1734. 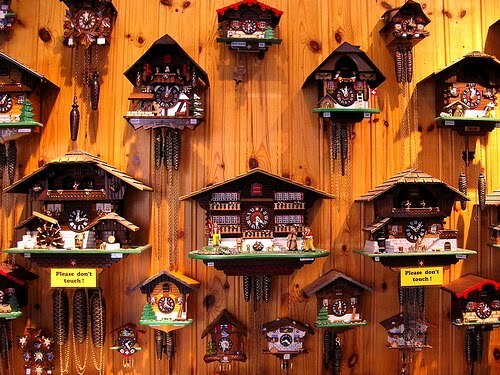 Whatever the real history is, the Black Forest is the tradition home of cuckoo clocks, and is still the area in which to purchase a “real” traditional cuckoo clock. Image from Deutsches-uhrenmuseum. Meanwhile, in other parts of the world, different animated mechanics were built into clocks. London jeweler James Cox built many clocks with fabulous birds and animals, often many of them together in one clock. In 1777, he was commissioned to build a automaton clock for Empress Catherine the Great of Russia. 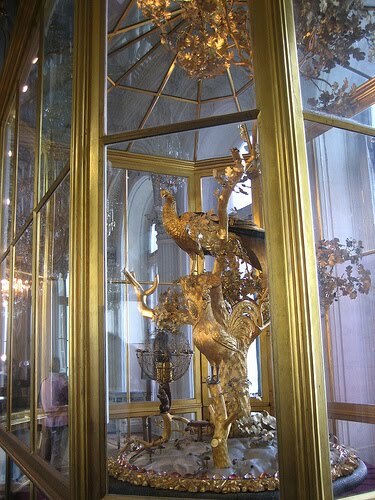 The Peacock Clock he built is still on display at The Hermitage in St. Petersburg, and still works. Image by Flickr user Karen Horton. This early 19th century clock by J.F. Houdin of Paris features a magician on top who comes to life at the top of the hour. As a bell rings, the magician nods, then uses his arms to make balls, cones, or dice disappear and reappear! 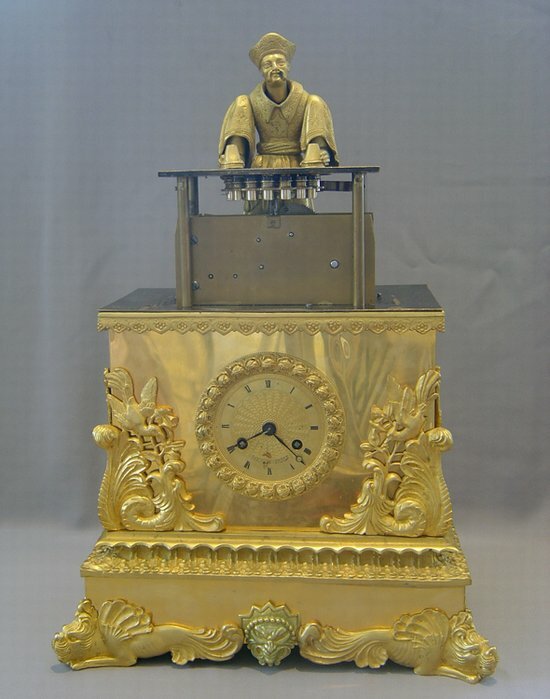 The largest automaton clock is the Nittele Nippon Terebi Clock in Nihon Terebi Headquarters in Shimbashi Itchome, Japan. Four times a day, a 3 minute 40 second animation entertains passers-by. The clock was designed by manga animator Hayao Miyazaki. Since the development of plastic and batteries, there are animated clocks available to everyone. 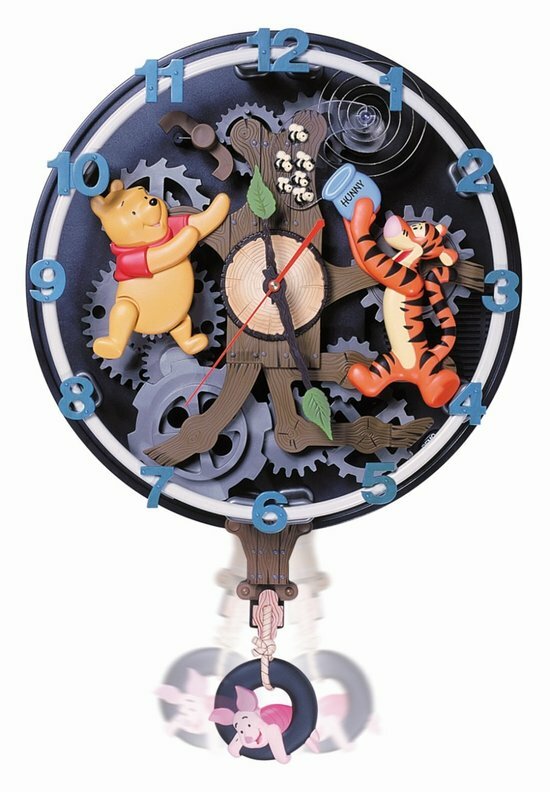 This Disney wall clock features Winnie the Pooh and Tigger, too, singing and playing every hour as Piglet swings on the pendulum. Here’s a terrifying way to tell time! 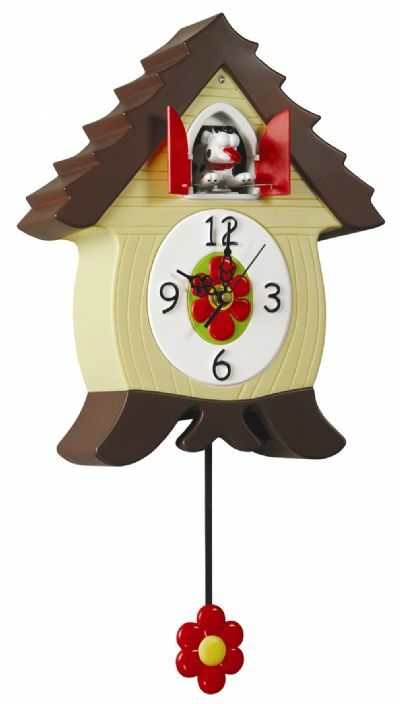 The Shining Cuckoo Clock was designed by Chris Dimino. To mark the hour, the demonic face of Jack Nicholson breaks through the door to say, “Heeere’s Johnny!” followed by the scream of Shelly Duvall. And finally, here’s the clock Jason’s little girl is looking for. The BarkCoo Dog Clock features a little dog that comes out and “woofs” the hour. Batteries not included.